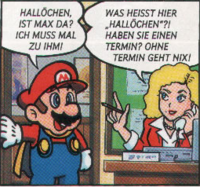 Mona is a character appearing first and only in the Club Nintendo comic "Super Mario: Coole Klänge". She works for Koopa Records and she is Max Milliplatt's secretary. Mona appears to be a very hard-working woman, as she is on the phone while talking to Mario and even tries to hold him back by pulling his Cape. However, her attempt fails, and so Milliplatt is angry with her for letting Mario enter his office. In the reprint of "Coole Klänge" called "Super Mario: Die Blume meines Herzens", Mona was not referred to by her name. This page was last edited on March 25, 2018, at 11:44.